Extreme heat makes keeping your space cool a whole lot more difficult. Here are some tips for helping your air conditioning unit keep your space cool! It’s late August and the “dog days” of summer are definitely here. Temperatures have been well into the 90s, and the heat index has been somewhere over 100. We are all feeling the effects of the late-summer heat, and your AC unit is “feeling” it too! 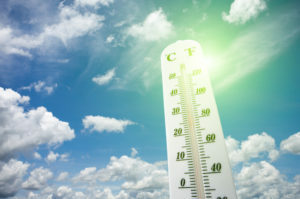 Extreme heat makes keeping your space cool a whole lot more difficult. Here are some tips for helping your air conditioning unit keep your space cool! Clean the outdoor unit. Make sure there are no leaves, sticks, or other outdoor debris around it. You may not think that these small things would make much of a difference but they really do! Keeping your compressor free of debris will help it run as efficiently as possible. Vacuum and un-block indoor vents. You probably don’t even realize you’re doing it, but you could accidentally be decreasing your air conditioner efficiency by blocking one of the indoor vents in some way. Even simply keeping the vents vacuumed out will help your AC unit run more efficiently, and keep the air in your home cleaner! Don’t put lamps or other heat-producing devices near your thermostat. The thermostat is what is telling the AC unit when it is time to switch on and off. If the air around the thermostat gets above a certain point, the unit will switch on until it is sufficiently cooled. If there’s something that’s making your thermostat warm, the air conditioning will stay on regardless of the temperature in the rest of your home. Close the blinds and curtains. While not all blinds will keep out the heat, closing all blinds and curtains will certainly help! If you find that part of your house gets more sun during the day, you may want to invest in energy efficient blackout curtains for that room. This entry was posted on Friday, August 31st, 2018 at 3:57 pm. Both comments and pings are currently closed.